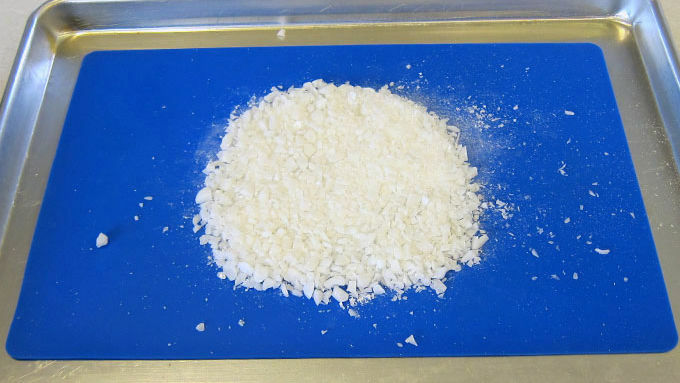 Preheat oven to 350° F. Crush white candies into small pieces using a meat mallet. Pour crushed white candy into a thin layer on a non-stick silicone mat. Bake for 7-10 minutes until melted. Remove and immediately cut using metal snowflake cookie cutters. Allow to cool, then break off excess candy. Crush blue candies into small pieces. Line a 10-inch round tart pan with non-stick tinfoil. 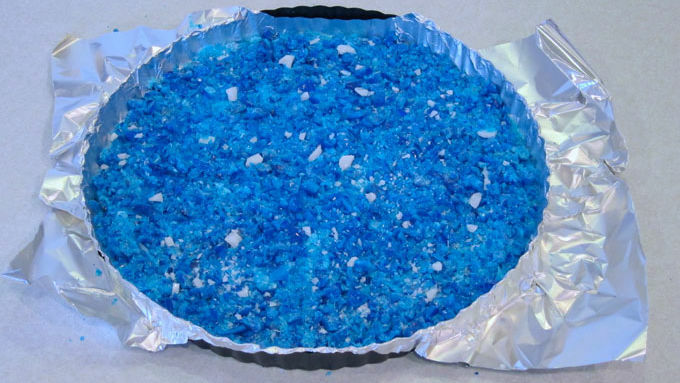 Pour blue candies into a thin layer in the bottom of the tart pan. Sprinkle on a few small pieces of the excess white candy. Bake for 8 minutes. 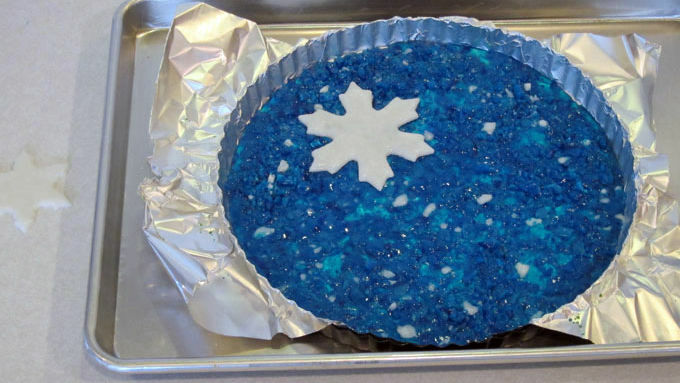 Remove and set the white candy snowflakes on top of the blue candy. 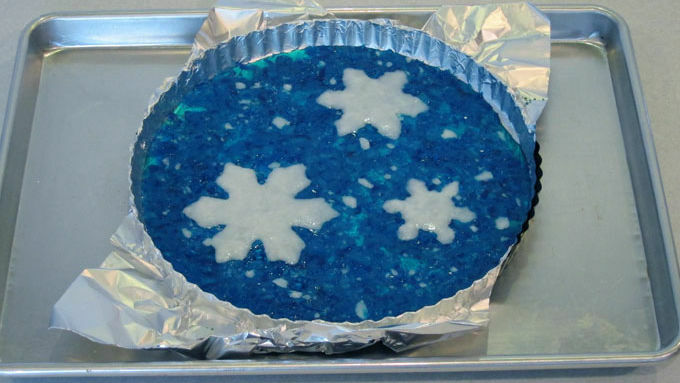 Return to oven and heat for 8-12 minutes, until the blue candy is melted and the snowflakes stick to the top. Remove and allow to cool completely, then peel off the tinfoil. Use the candy platter to serve sweet holiday treats. Serve your sweet treats on a beautiful mosaic platter made from hard candy this holiday season. Once the treats are gone, the platter can be broken and eaten too! This pretty platter is simple to make using store bought candies. 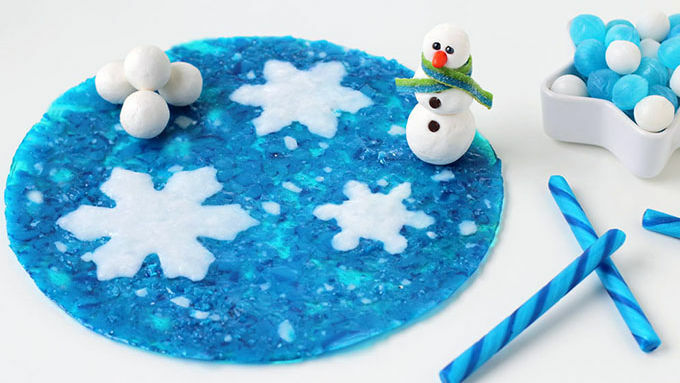 You'll need white candy for the snowflakes and a several shades of blue for the background. I used blueberry candy sticks and blue raspberry candies along with white coconut candies, but mints would work nicely too. 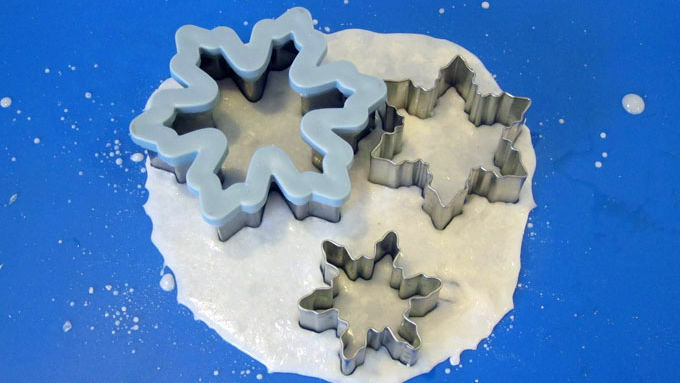 Before you begin, you'll need to gather up some metal snowflake cookie cutters. Three or more in various sizes (or one really large cutter) will work well. Molten candy can burn, so don't touch the hot candy! Be sure to allow the platter to cool for at least 90 minutes before removing it from the pan and peeling off the tin foil. Once it's ready, you can top it with sweet treats or just display it on your table.